Micromax A57 Superfone Ninja 3 is the new device in the gagets arena, which is a dual SIM smart phone with 3.5 inches capacitive display. It’s a low budget Android smart phone which offers decent look, design and over all assets in just Rs. 4999. 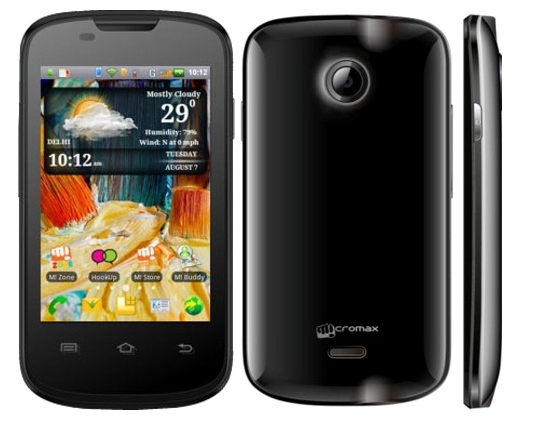 Micromax A57 is featuring capacitive touch display which offers the screen resolution of 480 x 320 pixels. Along with this you will also get the power of Android 2.3 Gingerbread which offers decent performance on 1 GHz processor and 256MB of RAM. As overall hardware specs are just above average, definitely it is not capable of running the latest Android 4.0 ICS version. Though considering the price point, Micromax A57 Superfone Ninja 3 is a great deal. Some of the other technical specificationsinclude 3 MP camera, internal storage of 512 MB which is expandable up to 32 GB via microSD card, it can deliver 8.5 hrs of battery backup and standby of 177 hrs. As we experienced previously the smartphones strugglinhgng hard to keep up with batter life promises, we would let you know the details in full review of Micromax A57. This Android device is preloaded with some of the Android apps and also a good blend with social networking sites. A57 also provides support to GPRS, 3G and WIFI, which is most amazing to have in this category. Micromax recenlyt has launch some of it’s mid budget smartphones and Superfone Ninja A57 is now the latest addition to the ‘A series’, but of course at the lower price point!